solved: Second Sock Syndrome, originally uploaded by earthchick. So. I broke my ankle and I made a sock. There’s a lot more to share, knitwise, etc., since my last post, but for now I’ll start here. 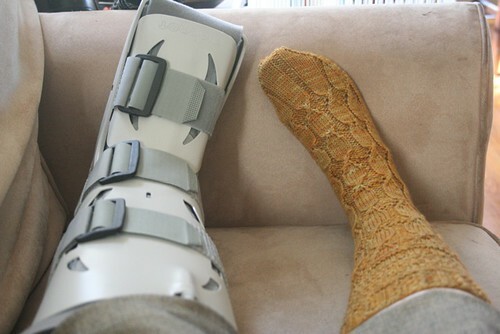 I broke my ankle a couple of weeks ago in a fiber-related accident. Or you could call it a clog-related accident. Or both. It’s the stupidest, most uninteresting broken bone story. I was walking through the living room, carrying Lila, my English angora rabbit. My ankle buckled, as has frequently happened in my Dansko clogs. But usually, I recover, no problem. This time, though, I think I must’ve been trying to keep from dropping the rabbit, because my ankle just kept rolling. And then I heard a snap. But two days later, I flew to New York, for my first ever Rhinebeck experience at the New York Sheep and Wool Festival. And it was pretty much everything I had hoped it would be (except for the no walking part). I rented a scooter and drove around meeting folks and having fun. Other than my lack of mobility and physical pain, it was a fantastic weekend, and I am so glad I didn’t cancel it after I broke my ankle. At any rate, it was Socktober, so I knit socks. I finished a long-standing WIP (pictures another time), and I knit along with the Through the Loops 2010 Mystery Sock. I’m almost done with the pair, but for now, one will do me just fine. I pretty much love it, as I pretty much love every Through the Loops design (did you see Kirsten’s latest pattern? LOVE!). 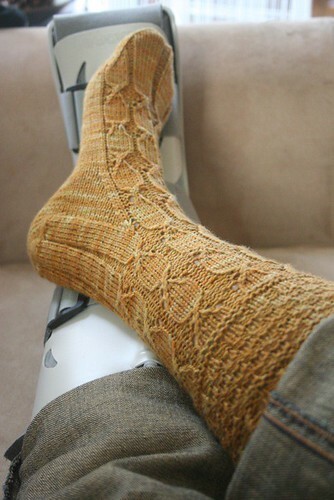 I love what Kirsten does with texture, and these socks are a great example of this. The sweet cuff, the tiny trowels (which look like little acorns, don’t they? 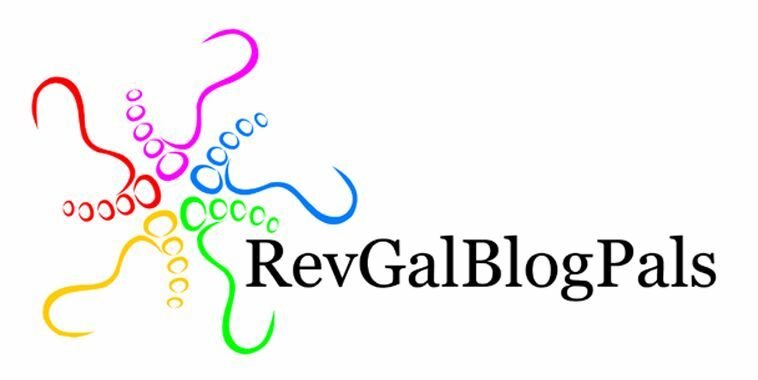 ), the long thick lines of the heel and toe – I love it all. Kirsten recommended a solid or semi-solid yarn for this pattern, and I’m thrilled with the yarn I chose. This is Kitchen Sink Dyeworks, by indie dyer Mercedes Tarasovich. It’s the Luxe Merino Fine (a superwash merino, cashmere, nylon blend), and the first of KSD’s yarns I’ve tried. It was a sweet knit, and I LOVE this colorway, which is called “Dram” (as in a serving of scotch). The color is exactly what I was looking for – a perfect honey brown for fall. By the way, if you knit these socks, I would highly recommend following Kirsten’s advice – don’t use a highly variegated yarn, a striping yarn, or a yarn that is too dark. This pattern is too lovely to waste on yarn that won’t show it properly. I knit the medium size (64 stitches) on size 0 dpns, which is my standard for socks. If I had it to do over again, I would probably shorten the heel a bit, but otherwise, I’m so happy with the sock, and can’t wait to finish (and be able to wear!) the pair! Those are really cute socks, and I love the combination of subtle colorway and pattern! Bummer about the ankle. I love my Danskos, but I know exactly what you’re talking about. Speedy recovery, and kudos for keeping your bunny safe from harm! well…that’s one way to deal with the dreaded SSS. happy thoughts for a smooth healing process. and man — the rhinebeck pictures i’ve seen all seem to feature you on that snazzy scooter. glad there was a way for you to enjoy the weekend, despite the whole not-being-able-to-walk-right-now issue. also, love the color of these socks. hooray for yellow, especially now, autumn into winter (a bit of flurrying here today)! Beautiful socks! Hope the ankle recovers quickly. At least you were still able to enjoy Rhinebeck! I was doing the KAL, too, but had to drop out when my socks (size medium) were just a smidge too tight … even on my teenage daughter, whose ankles are much more svelte than mine. I’m going to re-knit them, though … I think the pattern in lovely. The yarn you chose really works well. Oh, I’m so sorry to hear about your ankle! I have done that same ‘turnover’ many a time, regardless of shoe style. I love that you made it to Rhinebeck in spite of your injury! Ooh, very good for you to go despite the ankle. And the sock is up to your usual gorgeous standards! I am sorry to read about your injury. I hope your ankle is on its way to a speedy recovery. Your sock came out beautifully. 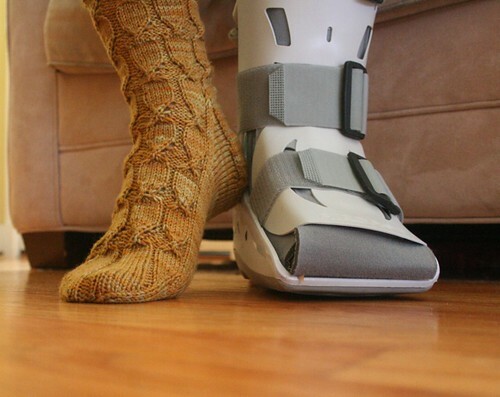 Gah – Sorry to hear about your ankle. 😦 But the sock sure is awesome! Hoping for a fast healing for you! Well, if life gives you lemons… knit! Oh, ouch! I have a bad ankle and having it buckle while carrying something important is one of my worst fears as I’m always sure I’ll injure myself severely. I sure hope your rabbit twitched her nose in a sympathetic way at you afterwards!